A few months ago I decided to stop spending so much money on clothes I don't really love or need, clothes from "fast fashion" stores, and clothes that don't fit the way I want them to. After weeks of lusting after the lace Alexa Chung for Madewell dress I concluded that the straight cut wasn't going to work on my hips and it was just too expensive. Instead I scoured Etsy for the perfect white lace frock and found it at autumns child. Its one of my dream dresses from the 1960's with delicate floral lace and flattering babydoll cut. Thursday night I dressed it up with red and gold for the office holiday party. Come and enter!In Love With Fashion Giveaway. Oh, you are so beautiful! What nail polish are you wearing? Very pretty! I had to learn that lesson, too. I won't buy something if I don't LOVE it. What's the point, otherwise? I borrowed it from my friend, its just a silver polish with Essie Luxe Effects glitter on top. It looks like tinfoil! So great to hear you're only buying things you love & know will last now! I've been trying to do that lately as well but def forget at thrift stores at times. 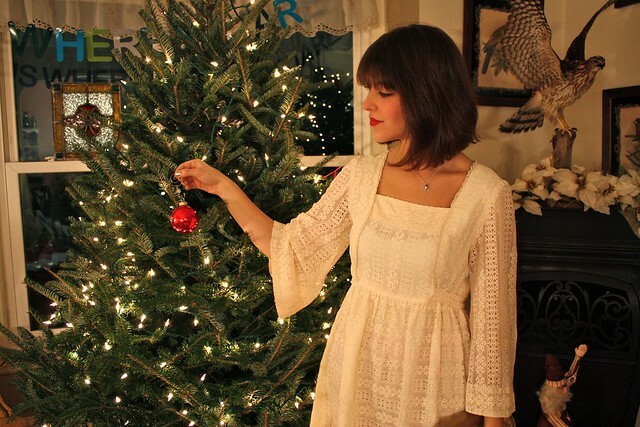 That dress is just perfect though, you look so pretty & Christmas-y! That dress is absolutely gorgeous. Such a beautiful find! this dress could not be any more perfect! You are so stunning. I love you in red lipstick and your hair is looking fabulous! What a beautiful dress, I love how you have styled it and you haircut is gorgeous. Hands down the most beautiful, delicate, perfect lace dress in existence. You look so charring! God, that would be creepy. I love this dress so much! It looks amazing on you and I really like how you styled it with the fun red tights and gold accessories. You're definitely wearing my dream holiday outfit! I heartily approve of going vintage for your cocktail dress-- a much more unique and affordable choice. Your gold shoes are dazzling and I really need to buy some colored tights soon. I love this outfit! I have an out of control obsession with lace dresses, and this one is absolutely perfect. I also still love your bangs, they look so good on you. I love this dress more than the Alexa Chung for Madewell one. Very pretty! Oh I love e dress and how u pulled your outfit together! You do remind me of Alexa Chung especially when you have ur sunnies on in your previous posts. That dress is absolutely beautiful on you and so timeless. I'm so glad that you were able to find a cheaper version! I love it paired with the gold and red. Your hair looks absolutely amazing and perfect match for this dress. it is beautiful and i love how christmas styled it is!! wow. you look amazing. I think that is one of the prettiest dresses ever. Beautiful! Not only is the dress gorgeous, but you surround it with wonderful accompaniments. The shoes and bag are terrific. And I've never seen your hair look better. Such a beauty, you look so lovely! Blooooody hell Kallie, you just get better and better. I'm doing much the same thing. I just can't bring myself to spend money on fast fashion things anymore, it feels wrong hah. And this dress you found on Etsy is gorgeous! It looks wonderful on you. I love your outfit! That is such a pretty dress! I LOVE YOUR DRESS! 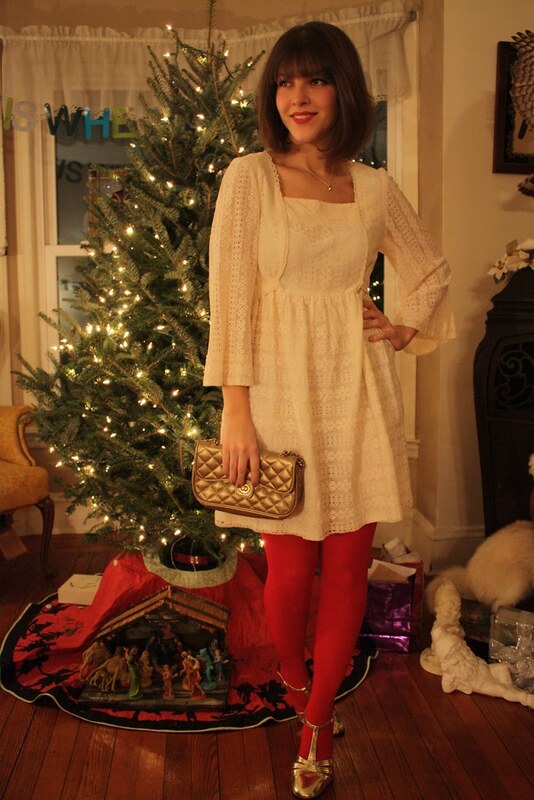 A white lace dress from the 1960s is the most perfect find, and I love how you paired it with red and gold for the holiday season. Beautiful. I absolutely love this outfit from head to toe! The color combo works perfectly. So festive but not over the top. Yeah, I'm in love. Oh my gosh I just ADORE this outfit! You look so absolutely beautiful! Red and gold is one of my favorite color combos for Christmas.I know exactly how you feel about "fast fashion" clothing stores. I'm glad that I've never actually went out and had the money to buy clothing like that though! I just take whatever I can get when my mom or josh has money :P.